If you’ve been hanging around Myers-Briggs enthusiasts for a while, you’ve probably heard about the Jungian cognitive functions. They are key to understanding Myers-Briggs theory, but they can also be very confusing. Basically, the four letters in a Myers-Briggs type tells you what type of mental processes you use most effectively in making judgements and decisions (Thinking or Feeling) and perceiving the world (Intuition or Sensing). It also tells you whether you are more oriented to the outer world or inner world (Extrovert or Introvert). Everyone has and uses four functions (out of a possible eight). Your primary function is the one you’re most comfortable with and use most effectively. It’s supported by your secondary function, which acts as a sort of co-pilot. The third and fourth functions are less well developed, and while we have access to them they are not used as effectively. You can look up your type’s cognitive functions on several websites, including PersonalityJunkie. Last week’s post focused on the four perceiving/learning functions, so this week we’ll cover the judging or decision-making functions. Everyone has an introverted or extroverted form of Thinking or Feeling in their function stack. We use one or the other most effectively when making decisions and thinking about what the world “should” be like. 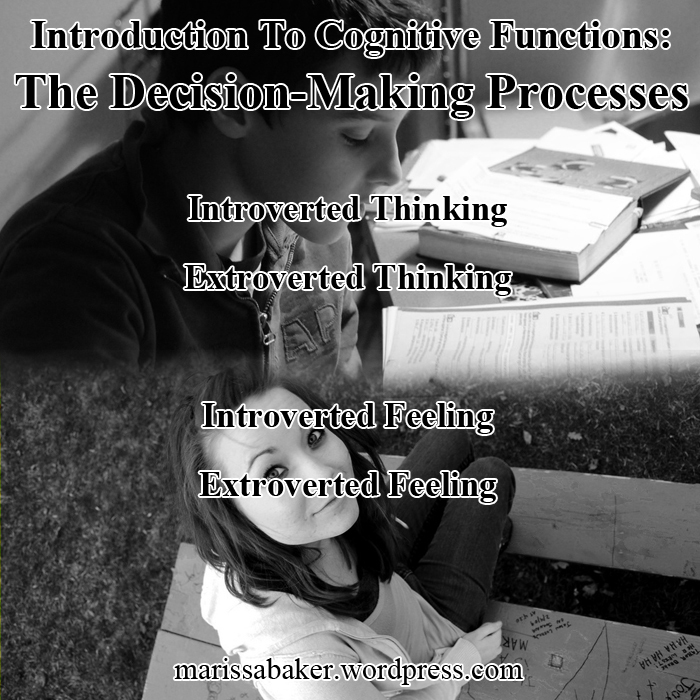 Most Myers-Briggs enthusiasts still refer to these functions by their full names or abbreviations, but I think the Personality Hacker labels are easier to use when first learning about cognitive functions so I’ll include those as well. Thinking types prefer to make decisions using an impersonal, logical approach. They value truth more than tact, prize accuracy, and want to make fair decisions. Accuracy is mostly concerned with whether or not data, ideas, and observations make sense to the individual. Types with this function are less concerned with drawing conclusions from data, and more concerned with creating theories, questions, and insights that line up with their internal fact-checking system. Types who use Accuracy rely more on their own power of observation and thoughts on a given subject than on outside sources when making decisions. This is the perceiving process used most effectively by ISTPs, INTPs, ESTPs, and ENTPs. The introverts use it as their primary function, the extroverts use it as a co-pilot to support their dominant learning function. As an outward-focused Thinking function, Effectiveness relies on facts and data gathered from outside sources when making decisions. These types want to experiment to find out what works and what doesn’t, and how they can be most efficient. It’s a practical function focused on finding solutions, discovering and classifying facts, and setting goals. This is the perceiving process used most effectively by ESTJs, ENTJs, ISTJs, and INTJs. The extroverts use it as their primary functions, the introverts use it as a co-pilot to support their dominant function. Feeling types prefer to make decisions based on their personal values and how the decisions will affect other people. They want to maintain interpersonal harmony, and may soften truth in an effort to be tactful. As an Introverted Feeling function, Authenticity wants to understand the self. These types make decisions based on what feels right, as influenced by abstract ideals. It is a focused, deep sort of way to experience emotion that many Authenticity types find hard to express to other people. This is the perceiving process used most effectively by ISFPs, INFPs, ESFPs, and ENFPs. The introverts use it as their primary function, the extroverts use it as a co-pilot to support their dominant function. When feeling is turned outward, Harmony focuses on getting everyone else’s needs met when making decisions. These types adapt themselves to given situations trying to fit in, and value the ideals and customs of their community. Harmony seeks true peace and understanding between people, and is adept at sharing feelings to create sympathy. This is the perceiving process used most effectively by ESFJs, ENFJs, ISFJs, and INFJs. The extroverts use it as their primary functions, the introverts use it as a co-pilot to support their dominant function. Thank you — your website is one of my favorites. When people ask me how to find out what their personality type is, Personality Hacker is the first place I send them. This is definitely true of me, but from my observations, STPs appear to prefer more tangible sources. It is possible I am wrong or reading this incorrectly, but basically I do not see STPs appreciating much in the way of theory etc. I always saw Ti as gathering fragments of data and filling in the blanks itself. NTPs and NFJs are much more concerned with this on a philosophical level while STPs and SFJs seem more interested only in real-world, immediate logic goals. ESTPs sometimes resemble ETJs in their forthright approach to life, since their Ni is inferior. While I do see ENTJs employing a level of experimentation, I think it is more related to Ni. My husband typically ‘follows the recipe’ when he is doing things, though may take a liberty here and there if he doesn’t like something. I am definitely the one who experiments. Even morally, I toy with possibilities to ensure that my moral perspective is airtight, while for him ‘it is what it is’ because God said so (Bible). I agree with him but as an INTP I value discovering WHY God said so because I think he is a reasonable God. I see him looking up YouTube videos in order to fix his playstation on his own and stuff, but rarely experimenting. Sometimes he just likes to settle with what he already knows works, rather than trying new foods, methods, etc. I am pretty sure his Ni is a little weak because his mom is an ESFP and his dad just watches a lot of TV and goes golfing with him, whereas I was raised by an ENTP mom and my older brother is also an ENTP. So I would argue that the experimentation you refer to is actually an intuition thing. STJs don’t experiment much either to my knowledge. To be clear, I am a big fan of tact but I am not good at employing it, so I don’t want to come off as argumentative or like you have to change it if you have a difference in opinion. I might have also just misinterpreted your statements but what do you think? I welcome comments from people who want to discuss ideas or point-out something I might have missed 🙂 As an INFJ, I don’t really have much direct experience with Thinking functions, so most of what I wrote is based off Personality Hacker’s descriptions and Isabel Myers’ book “Gifts Differing,” as well as observations of INTP, INTJ, ENTJ, and ESTJ friends. I think perhaps we’re disagreeing over word-choice. For Ti, you noted that xNTPs are more likely than xSTPs to be focused on theories. I definitely agree with that, but I also talked about Ti types generating questions and insights that relate to the facts they’ve gathered. That part doesn’t have to be theoretical, and perhaps xSTP types are simply using their fact-checking function and the questions they come up with to serve their in-the-moment Sensing side (as opposed to the Intuitive xNTPs, who are more concerned with future possibilities). For the xNTJ types, I mean “experiment” in the sense of testing out different ways to do things in order to find out what’s most efficient. My INTJ sister, for example, says she isn’t sure she’d be comfortable working in a wholly theoretical field, but she does value trying things out and testing different methods to find the most effective way to accomplish a task. If that’s not the way it’s “always been done,” then the established way get’s thrown out the window (I think xNTJ types do this more often than xSTJ types, who value tradition). I think perhaps we Intuitive types don’t give our Sensing counterparts enough credit. It’s true they are more interested in the past or present way of doing things and maintaining the statues quo, but that doesn’t mean they don’t daydream or think deeply about things (as an ISFJ recently pointed out to me). They just do it in a different way. Their questions and experiments will have a different focus and goal than an Intuitive’s. What phrases would you suggest to better describe Thinking functions and describe the way they’re used by both Sensing and Intuitive types? I completely agree with sensors not getting enough recognition. My father is an ISFJ and he is very intelligent (and quirky – no one seems to get how quirky and intriguing the SJs often are). I have noticed however, that it is usually the STs that scoff the most at, for example, personality theory. SFs are more interested because it relates to people they might want to reach. STs tend to be more of the programmers that I meet than NTs, however, which showed me when I started getting into MBTI, that they simply have a different focus for their intelligence than we do. NTPs tend to get bored with things like programming, just like STPs get bored with our impossible-to-prove/non-applicable theories. Not to say that goes for everyone across the board (I knew one probable ISTP who seemed to like some level of philosophy and a probable INTP who hates MBTI theory to be brought up for unknown reasons lol), but seems to generally be the case. That might not be the best wording, but I think you get what I mean haha. I do think NTJs experiment for sure, I just think experimentation has more to do with intuition, being that intuition is a learning function. If Te makes a decision, then all it does is determine the results of the experiment, which was made by the learning function of Ni. My husband’s Ni is underdeveloped. I thought he was an ESTJ for a long time until I studied both him and functions more. He does experiment some, but I mostly picked out his type by the obvious presence of Se, and the complete non-understanding of Si-ish thinking, a function I love very much even if it is impossible to describe. But yeah, back on topic… I just see far more evidence of experimentation in intuition than in thinking, because experimentation requires theorizing. I find that sensors, in contrast, draw from experience and thus need far less experimentation to recall what the best methods are.